With a couple of weeks remaining before Christmas we managed to squeeze in a work related visit to a software vendor. It happened to be in the San Francisco area and given we arranged the meeting for a Monday I figured why not head out a little early and just enjoy the weekend. I always love visiting San Francisco. So I booked travel to leave early on a Saturday morning. With the added bonus of a 2 hour timezone change that meant I could plan on being in the heart of the city by noon. So what do you do when you’ve got 36 hours to bum around the city of San Francisco? I ended up walking a lot! and eating a lot too! And naturally, I took a few photos along the way. The first thing very apparent upon arrival at the Powell Street BART station was there were an awful lot of people wearing red outfits. I mean Santa type of gear. Hats, pants, boots, the whole shebang. 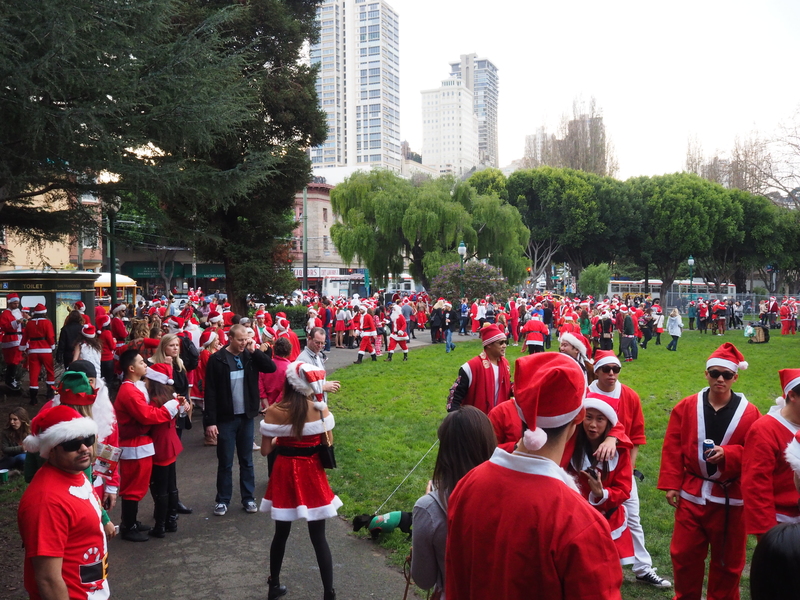 The streets around Union Square were teaming with Santas. But it wasn’t just there. It was all over the city. The photo I included here is just one I took of Washington Square Park. Turns out it was “SantaCon“. Apparently such a thing has been going on for years but it was new to me. Looked like mostly a roving party. Lots and lots of revelers and the booze was flowing. It was entertaining to watch – let’s just say some of the outfits or lack thereof were pretty crazy – but I kept on with my touristy walk around the city. My hotel stay was about a block off Union Square. 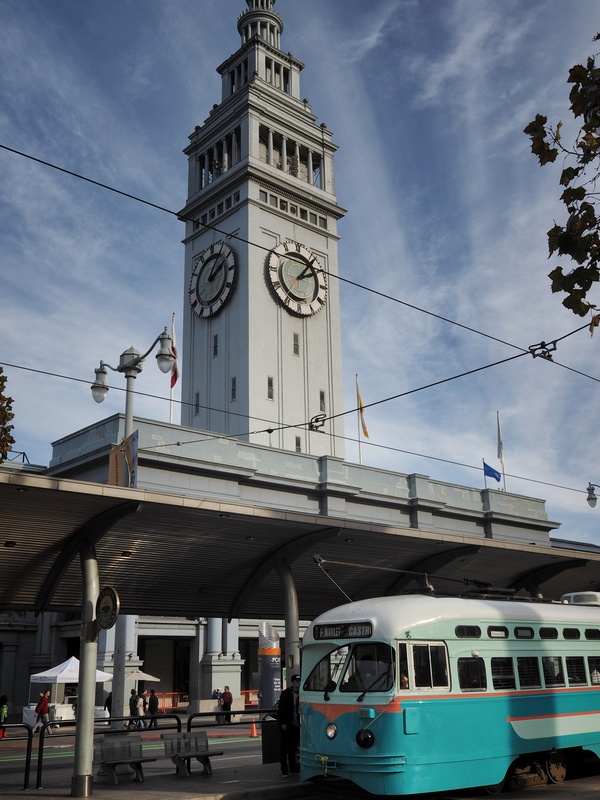 From there I meandered down Market all the way to the Ferry Building. For one, I just like to check out the shops in there and turns out there are also a lot of craft booths nearby on the weekends. You can always catch a bite to eat as well and with pretty decent weather that first afternoon I hung out at Gotts. They make a good grilled chicken sandwich and it’s fun to do a little people watching from that vantage point. 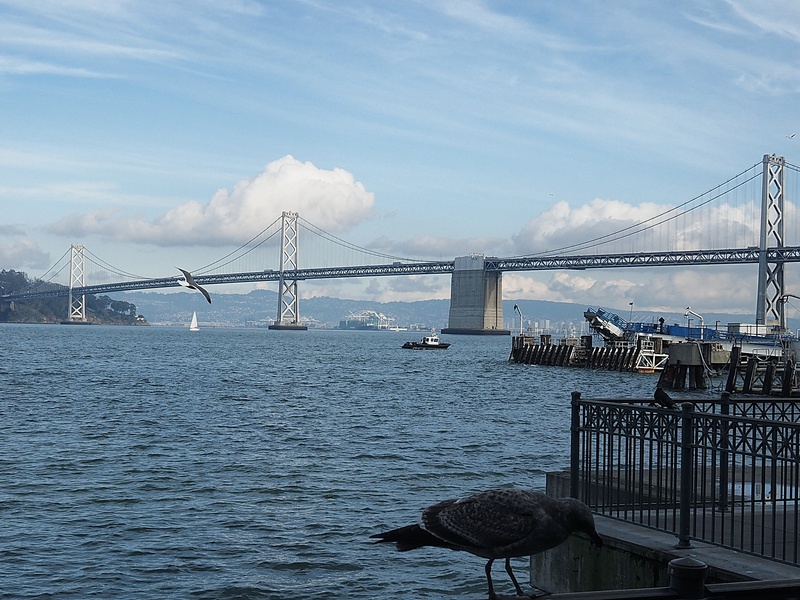 The rest of the afternoon was spent wandering down the embarcadero and up to Coit Tower and then over to Washington Square Park and back up through Chinatown.. You can see some of the photos I took that afternoon to the right. The one at the top was taken on Pier 7 looking back into the city. By that time of day it was clouding up and I did a little post processing on that photo to give it a bleaker look than it really was. The one below that one was taken about the time I had lunch at the Ferry Building. I like the old streetcars they have fixed up and are still using in SF. The more full sized photo at the bottom of this posting is of the Bay bridge. Not a perfect photo by any means and yet I like that one. The birds, the boats and puffy clouds… seemed to capture the moment for me. 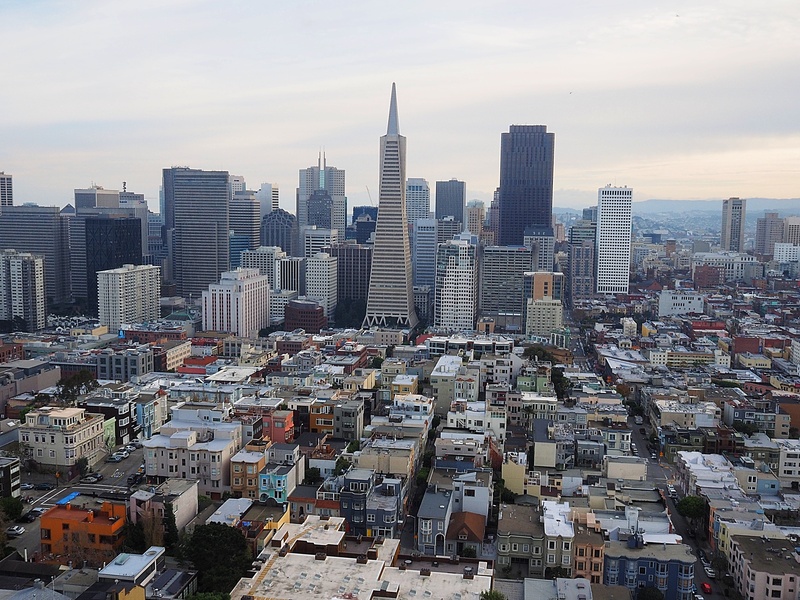 The aerial photo of the financial district was taken from the top of Coit Tower. In all the visits I’ve made to San Francisco, I can’t recall ever taking the time to get a ticket to the top. So this time I took the opportunity. Great views of the city from up there. 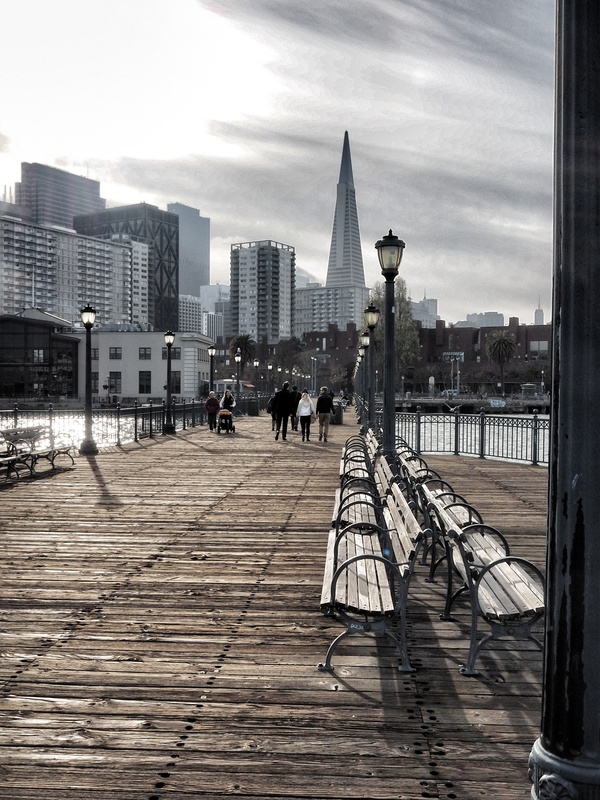 And the walk up the stairs from the embarcadero to get to the tower is pretty cool as well. I can’t imagine what it costs to own a home on that hillside. There were some very cool looking places tucked in there. Sunday I took the opportunity to head further west. In fact, to go all the way to the coast to Lands End and the Chart House. From the Union Square area it’s not exactly a walkable destination. It’s something like 80 blocks west of Union Square. I grabbed a bus instead. Even on the bus it was more than a 30 minute ride. I think we stopped almost every block. Most of the intervening city isn’t all that much to look at. But arriving at Lands End – that was definitely worth a look. There’s a really nice visitors center at Lands End. And from there, you can hike the coastal trail north for miles. 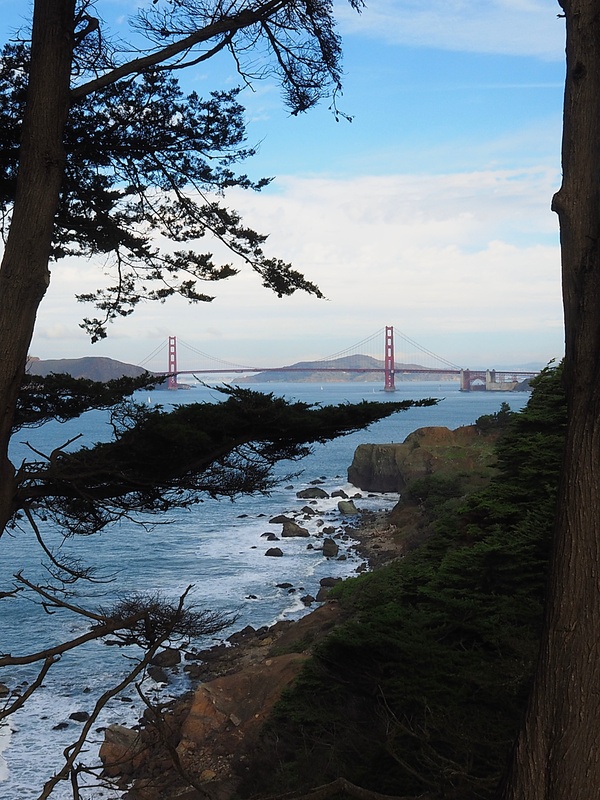 You can see at least one photo here that I took along the way of the Golden Gate bridge. I took in only a part of the trail. I could easily have spent the entire day there. Instead, I routed over through the fisherman’s wharf area. I didn’t bother much with pictures in that area. Mostly the wharf area is kind of an eyesore in my opinion. Ok, the Ghirardelli Square area on the western edge is kinda cool but a lot of the rest of the area is just tacky touristy stuff. 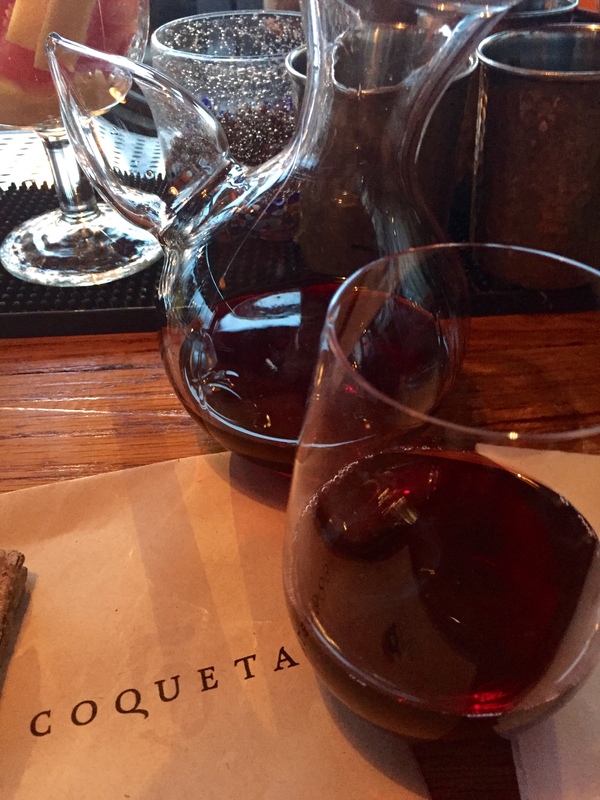 Eventually I wound my way back south and to near Pier 5 to a place named Coqueta. The location right along the water is pretty cool. There are essentially two parts to the restaurant. The outer part is a little building with a lot more windows. Mostly it’s a bar. 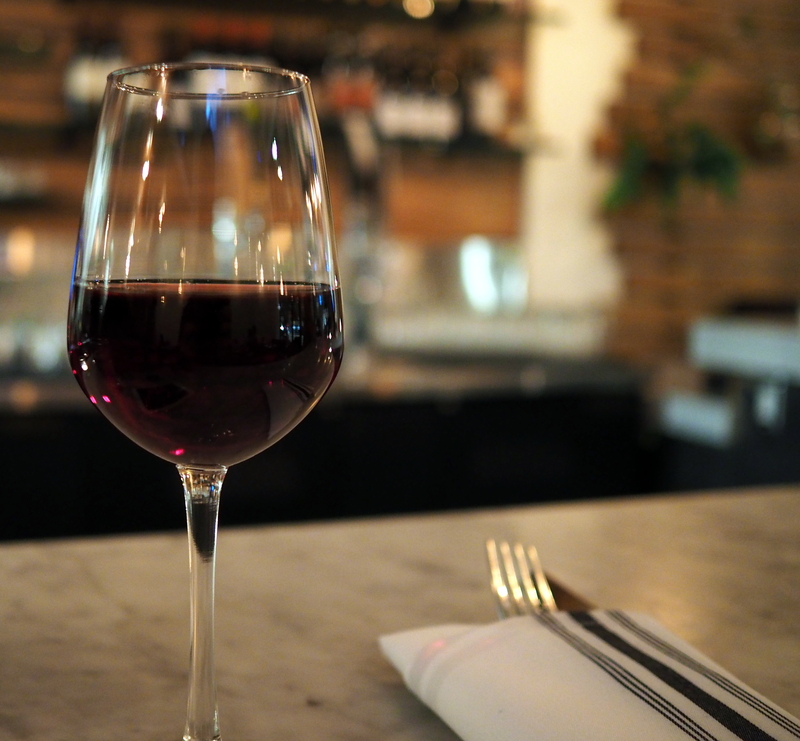 You can see a shot here of the wine carafe they use to serve their wines by the glass. The speciality at Coqueta is Spanish tapas. Small plate restaurants are all the rage. The fare here was pretty good. I had a couple of the cheeses, some kind of lamb meatball dish (that I wish I had better details on because it was really good) and an interesting potato dish. Plenty of food and yet all the servings were pretty small. If you have a hearty appetite here it can get pricey fast. I’d give the place thumbs up though and wouldn’t hesitate to go again. 36 hours goes by mighty fast when you’re trying to cover as much ground as I was. Next time – and I’m sure I’ll visit again – I’d spend more time on the coastal trail though.